Best Burgers: Which One Will You Choose? In over 35 years in the business, Barney’s Gourmet Hamburgers has tried a lot of combos. We try something new on a burger, find out that we love it, offer it to the public and…sometimes it works, sometimes it doesn’t! But as many as have come and gone, some stick around our burger bar for decades. Here are the best burgers you’ll want to try if you’re heading to Barney’s for the first time. If you watch The Simpsons, you’re probably familiar with the times Homer has leaned his head back and drooled when he sees food that looks beyond amazing. That’s exactly what he would do if he were to see the Voodoo burger: bacon, provolone and bleu cheese, all topped with mushrooms sauteed in our spicy voodoo sauce. All of that on a half-pound burger better than you’ll find at any other burger shop. While it might be a little more simple than the Voodoo burger, it’s hard to beat the Alpine burger for the way that the flavors play off of each other perfectly. We start with our perfectly-cooked half pound burger patty and then add Swiss cheese, sauteed onions, and sauteed mushrooms. Even if you’ve had these ingredients together before, using the best ingredients ensures that you’ve never tasted them this good. Here’s one you won’t find at any other burger restaurant! Once again, it starts with our amazing half-pound burger, and then adds sauteed zucchini, bell pepper, and carrot in our spicy Caribbean jerk sauce. Think you know what this is going to taste like? Think again! 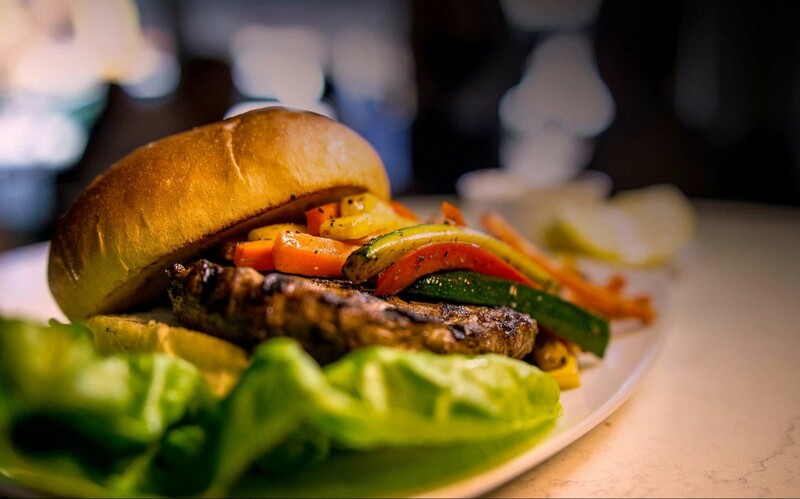 And with the sauteed vegetables, the Caribbean ends up being one of our healthiest burgers. Don’t just settle for any burger; stop by the best burger restaurant around and order up a gourmet burger like no other. We hope to see you soon in Brentwood or any of our other nine Los Angeles or Bay area locations.